SOUL SISTER: Suera, who died at the slaughter, though her body and those of her family (a Lifemate and a two-moon old daughter) were never found. This still lingers on Ame's mind. DAD: Shike, possessed the magic of self-change. The most repeated shape he took was that of a Desert Tiger. Ame swears that how Shima got her stripes. Died at the hands of a human at the Slaughter. He was over 5000 years old. COLOR/LOOKS: Multicolored. Has browns, grays, and blacks. Really quite ugly for a dune dog. PERSONALITY: Not the brightest of the Dune Dog breed, though he does have his moments. Ame suspects he is actually much more intelligent than he appears. Digger likes to spend most of his day digging up the garden, and he has a great love of red globe fruit, which Ame has to fight him for. He saved her from a hunter's snare, by stumbling into it himself. Now walks with a slight limp. HAIR: Blond, hangs almost to her feet when down. Usually has it tucked up in a twist or braid when she's out. When hunting, Is in a tight french braid, wrapped closely to her head. SCARS/DISTINCTIONS: Nothing worth mentioning. Probably bound to have some scars. A very colorful elf. She likes her bright colors. She usually wears simple gowns around the holt. Something breezy and easy to work in. When she hunts she dress in tans and browns. At the Holt; purple, green, blues, yellows, etc. JEWELRY: The more the better. Likes to wear bangle bracelets on wrists and ankles. Large gold hoop earrings and gold necklaces. When she hunting she wears none. WEAPONS/TOOLS: More at home with a hoe and a rake Ame prefers to let the younger elves hunt. However, when needed, she can still clip a fly's wing with an arrow at 100 yards. Ame has seen a lot in her 700 years. She has seen hundreds of elves born and killed. She and Kaze survived the Slaughter more by luck than skill. Kaze was one of the scouts when the humans attacked. His throwing arm was injured badly by a human's arrow. Tomar ordered Kaze into the cave with the children. One of Tomar's final commands was for Kaze, to protect the kitlings. Then Tomar asked Ame to help with the children and keep them calm. Ame will never forget the darkness that surrounded her as they were sealed in or the sobbing of frightened children. It took all her mental strength to block their sendings to their parents. 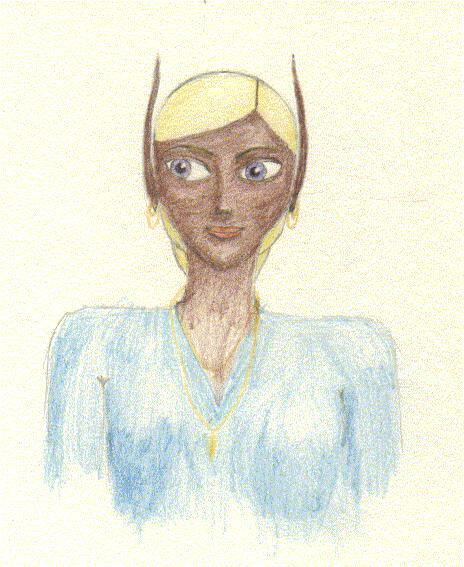 Ame was no fool, she had seen the number of humans and knew the chances of the elves outside surviving were slim. She didn't want the children cries to be a distraction. She did let the elves dying outside touch minds with their children one last time. Hana, her oldest child sent the love she felt for her mother and step-father as her life was taken. It all of Ame's strength to keep Kaze from trying to get to Hana's side. Even before the rock shaper released them from their tomb Ame knew what carnage they would find. She held most of the small children back and the cries of the ones that escaped convinced the others to stop trying. Ame and Kaze quickly agreed with Onsha that leaving was the only choice they had. TALENTS (MAGIC): Can send and has great mental abilities. Can't levitate or nothing like that. Ame can usually reach the most distant hunter or scout. Why she can't get a response from Kigen bothers her, but because Shima insists he's alive, from time to time she keeps trying. PERSONALITY: Very unrestrained. If the elves had a PTA chapter she'd be the head of it. Loves children and doesn't mind keeping an eye on them while their parents are busy. Her famous sweet roots pies makes everyone drool. She wishes Shima would get on with her life but does not press the matter. If she's in the garden, which she almost always is, and you want to talk to her . . . better be ready to work. She'll have you pulling weeds before you know it. SKILLS: She has a love of gardening, and it seems as if she has the talent of plant shaping, her garden grows that well. A dead shot with her bow. OUTLOOK ON LIFE: Live, love, survive, and get a good meal ever so often! LIKES: Watching Akan lick the batter from the spoon, Shima's smile, she doesn't see it much any more, and hugs. DISLIKES: Digger in her garden, Kumo's Desert Tiger in her house, and her children being hurt.